Hey friends. Been a minute. I'm still here. Basically, been in a doctoral program studying Educational Leadership for Social Justice at Loyola Marymount University. Fun stuff. Busy stuff! With the holidays coming, I wanted to send a short plug for books as holiday gifts. 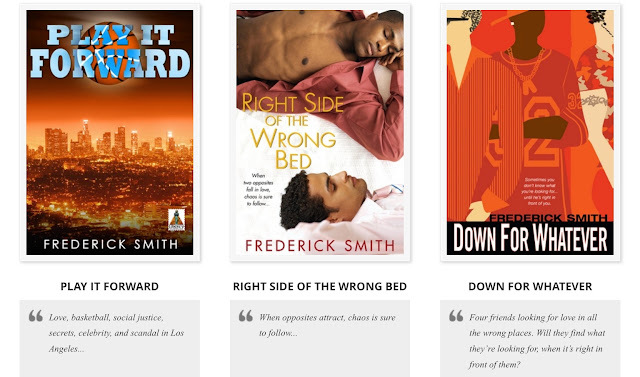 And mine -- Play It Forward, Right Side of the Wrong Bed, and Down For Whatever -- showcased on my Amazon Author Page -- will be perfect romance and social justice novels for your friends. More info on my official website www.FrederickLSmith.com. Also adding some book club and small speaking engagements here and there. Skype and FaceTime are awesome ways to set up events with your groups. Let me know.